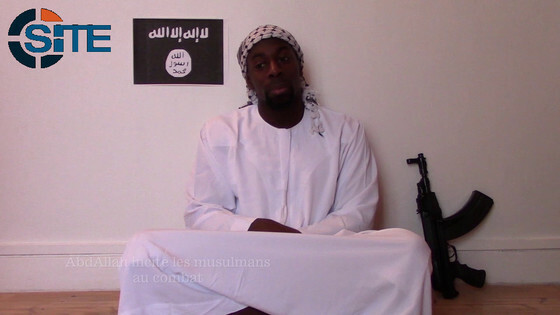 A new video has been posted online showing Amedy Coulibaly, who killed a French policewoman and attacked a kosher market in Paris last week, pledging allegiance to the Islamic State and its emir Abu Bakr al Baghdadi. The video does not appear to have been produced by the Islamic State, as it does not bear any of the group’s usual markings. The video was first obtained by the SITE Intelligence Group, which notes that it was released by jihadists “linked” to the Islamic State. Coulibaly is identified as “Abou Bassir AbdAllah al-Irfiqi” and as a “soldier of the Caliphate” in the opening screen shots. Coulibaly trains for the attacks, doing pushups and other exercises, in the opening scenes of the video. Weapons and ammunition are displayed on a floor. He mentions the international coalition’s war against the Islamic State. Parts of the video were recorded before last week’s attacks began, but some of the production appears to have been put together as the manhunt for Coulibaly and the other terrorists was ongoing. The video suggests that Coulibaly had one or more accomplices, in addition to the Kouachi brothers, as the footage was clearly spliced together after his death to explain his involvement and motivations. Authorities are currently looking for his girlfriend or wife, who is believed to have traveled to Turkey or Syria. Coulibaly claims to have coordinated his actions with the Kouachi brothers, who separately assaulted the offices of Charlie Hebdo. The claims made by Coulibaly in the video are consistent with an interview he gave to a French television channel shortly before he was killed. Coulibaly told BMFTV, an affiliate of CNN in France, that he served the Islamic State and worked in concert with the Kouachi brothers. Numerous press accounts published in the past few days have explored the Kouachi brothers’ ties to AQAP. At senior leadership levels, AQAP and the Islamic State are bitter rivals. AQAP rejects the Islamic State’s claim to rule as a “caliphate” stretching over large parts of Iraq and Syria. And the Islamic State claims to have expanded its presence into Saudi Arabia and Yemen, thereby usurping the authority of all other jihadists, including AQAP. Both groups have traded sharp verbal barbs in the ongoing debate between the two sides. Harith al Nadhari, a senior AQAP ideologue who praised the massacre at Charlie Hebdo’s offices in an audio message, is a staunch critic of the Islamic State. But the relationship between Coulibaly and the Kouachi brothers predates the rivalry between the Islamic State and al Qaeda by many years. It is possible that their longstanding friendship trumped the jihadists’ leadership disputes when it came time for them to act. Unverified statements attributed to AQAP have claimed responsibility for the attack on Charlie Hebdo, but not Coulibaly’s shooting of a French policewoman and assault on a kosher market. Western officials continue to explore the extent of AQAP’s involvement with the Kouachi brothers. I’m guessing he probably filmed the video himself. The one where he is doing press-ups is probably taken when he was in prison. I think his allegiance to the Islamic State was just an on the spot moment and I don’t think he seemed to know the Kouachi brothers that well, when they pledged allegiance to Al Qaeda in the Arabian Peninsula. I think he was bigging up the connection to make it look like he was part of a bigger terror plot. “DGSI phone surveillance on Chérif Kouachi was suspended at the end of 2013, and on Saïd in the summer 2014, according to the Libération newspaper. Wiretap warrants were not renewed because there were other priorities and Chérif, at that time, seemed to be moving in the direction of peddling fake goods. He wasn’t really in touch with the most dangerous people in radical Islamic circles,” a French government source told Libération. I’m going to speculate freely without any sources, and guess the french security services may have been set up to fail from within.